182 pages | 6 B/W Illus. The Anthropocene is a volatile and potentially catastrophic age demanding new ways of thinking about relations between humans and the nonhuman world. 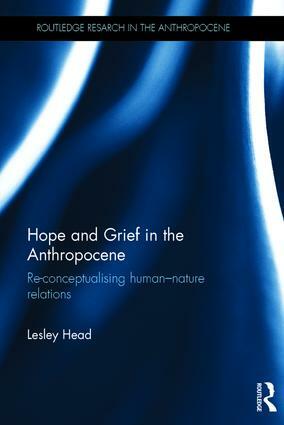 This book explores how responses to environmental challenges are hampered by a grief for a pristine and certain past, rather than considering the scale of the necessary socioeconomic change for a 'future' world. Conceptualisations of human-nature relations must recognise both human power and its embeddedness within material relations. Hope is a risky and complex process of possibility that carries painful emotions; it is something to be practised rather than felt. As centralised governmental solutions regarding climate change appear insufficient, intellectual and practical resources can be derived from everyday understandings and practices. Empirical examples from rural and urban contexts and with diverse research participants - indigenous communities, climate scientists, weed managers, suburban householders - help us to consider capacity, vulnerability and hope in new ways. Lesley Head is Redmond Barry Distinguished Professor and Head of the School of Geography at the University of Melbourne, Australia. This book was written while she was Director of the Australian Centre for Cultural Environmental Research, University of Wollongong, Australia.